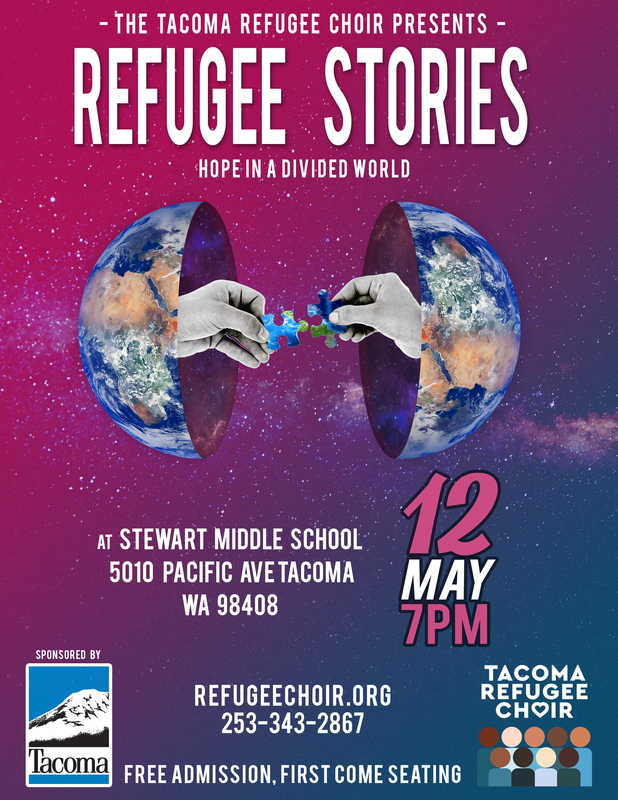 Tacoma Refugee Choir invites you to join in an evening of music and storytelling grounded in themes of hope, heroism and compassion amidst adversity. “Refugee Stories” will feature Tacoma Refugee Choir in collaboration with local artists as they explore songs and stories surrounding refugee experiences and celebrate the invaluable contributions of refugees in the Tacoma community. There will be a brief talkback after the event. After hosting two successful Community Sing-Along events, Tacoma Refugee Choir plans to delve deeper into conversations about experiences our refugee community members encounter and accounts of courage and resilience in meeting those experiences. The program will include several original songs composed by refugees within the ensemble as well as dance, original poetry, stories by refugee community members, a guest performance by Caribbean singer Anthony Cole and artwork by Jonathan Hanks. Tacoma Refugee Choir is a nonprofit music ensemble committed to the mission of building a more welcoming community through song. By creating opportunities for people to come together through music, TRC strives to create a welcoming, supportive network of refugees, immigrants and allies in the Tacoma and surrounding communities.